Unless the Iditarod Trail Committee receives an injection of money before March, the prize winnings paid out to teams that reach Nome could shrink by about $250,000 next year. Under 2018 race rules, the Iditarod says it will distribute at least $500,000 among the finishing mushers. The highest percentages will be paid to teams in first through 20th place, while the rest get $1,049 each. In the last race, the first 20 mushers to Nome shared about $150,000 more. Plus, the race paid more money to the top 30 mushers. In 2017, Jason Mackey won $11,614 for his 21st place victory. Next year he would earn just $1,049 for the same finish. Altogether, the 64 teams that finished the 2017 Iditarod won a total of $748,166. 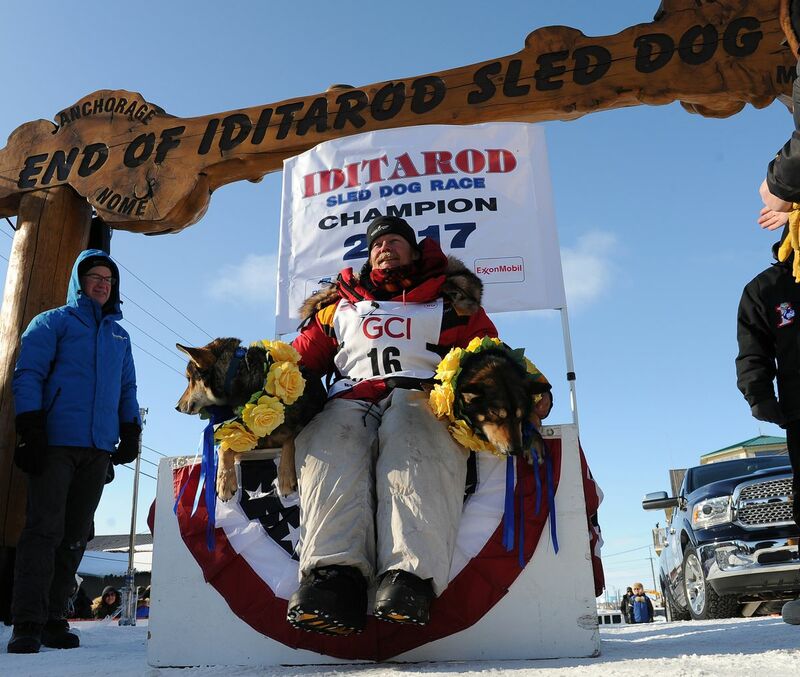 Iditarod chief executive Stan Hooley said in an interview Thursday that the race had to cut back on the prize amounts in 2018 so it could rebuild its savings. "In a number of years we paid out more prize money than our overall earnings generated, which means that we depleted reserves," he said. "We're at the point that we need to make difficult decisions to improve the financial health of the organization." Hooley declined to provide a copy of the Iditarod's operating budget for the past fiscal year and the current one, but said race expenses continue to mount, outpacing revenue growth. The budget for the 2018 Iditarod is about $1.7 million, according to information provided by Hooley. "I can't really point to just any one area as a reason for us being where we are," he said. He said the Iditarod did not earn as much as it anticipated from selling merchandise in the past budget year and it fell about $49,000 short of its sponsorship goal — and that was before top sponsor Wells Fargo told the Iditarod in May it would pull out of the race. Both Wells Fargo and the Iditarod have declined to say how much the bank contributed. The Iditarod finished the past budget year with a loss of about $11,800, according to Hooley, following a loss of about $172,000 in the previous budget year, which ended June 30, 2016. Iditarod mushers felt the impacts of the gloomy financials in the 2017 race, with a last-minute 5 percent cut to the purse. Instead of splitting the rule-established minimum of $750,000 among the top 30 teams, the Iditarod dished out $712,500 to them. Though Mitch Seavey, 2017 Iditarod champion, posed in March for photographs at the finish line in Nome holding a large $75,000 check, he actually earned just $71,250 for his victory. Hooley said other budget cuts included a 17 percent reduction to its communications budget, 3 percent to compensation and 9 percent to checkpoint supplies and operations. Hooley said he did not yet know how much money the first place team of the 2018 Iditarod would win. He said he hoped the Iditarod Trail Committee would bring in more money than it expected over the next few months so it could exceed the purse minimum of $500,000, roughly a 30 percent drop. After years of growth between 2011 and 2016, the $500,000 payout would bring the minimum purse back to 1999 levels, Hooley said. 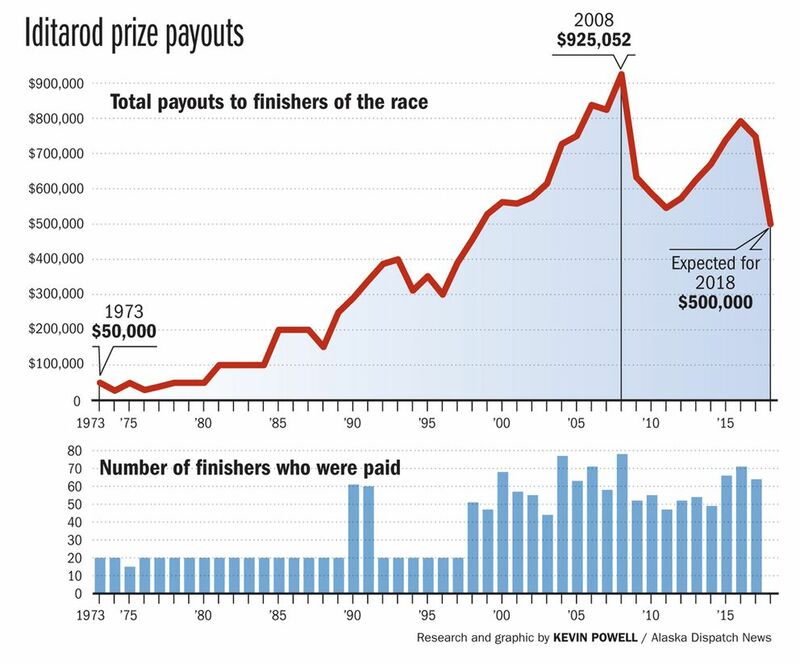 The last time the Iditarod gave bigger payouts to the top 20 mushers instead of the top 30 was also 1999. Hooley said the Iditarod plans to rebuild its reserves so it can absorb "the inevitable ups and downs" in the future. "For a number of years we paid out more in prize money than earnings would really generate," he said. "Now we need to take corrective action." Wade Marrs, the musher representative on the Iditarod Board of Directors, said Wednesday that he had not yet received much feedback from mushers about the purse shrinking, but he anticipated it would have a "pretty big effect" on the race over time. "The less money that we're winning in the race, the less financially worth it it is to run," he said. "It's something that I'm not very happy to see." Marrs, who placed sixth in the 2017 Iditarod and won $38,190, said he cannot simply reduce his personal expenses just because the prize money is shrinking. He said he still has to buy food for his dogs and keep a kennel of a certain size to have a team every year. "I don't want to be less competitive," he said. "I have my fans to please and sponsors to race for." Musher Paul Gebhardt of Kasilof said in an interview Wednesday that it costs him about $96,000 a year to run his 80-dog kennel and about $30,000 to race the Iditarod, including the $4,000 entry fee. He said it's frustrating that the ability to win some of that money back is decreasing. "It's very disappointing," said Gebhardt, who has placed in the Iditarod's top 10 eight times. Gebhardt compared the 1,000-mile Iditarod payout to the Kusko 300, a 300-mile with a $150,000 purse in 2017. "Look at what Kusko pays out for a 40-hour race versus what Iditarod pays out for an eight- or nine-day race," he said. "Somebody is not doing their business right." The Kusko 300 purse comes from sponsorships and Bethel gaming operations, including pull tabs. The Iditarod expects to get the biggest share of its revenue from sponsorships during the current budget year, totaling $1.42 million or 39 percent. The next largest revenue amount is $630,000 from raffles. The other 1,000-mile sled dog race that travels through Alaska, the Yukon Quest, will offer mushers a minimum purse of at least $125,000 in 2018, race officials announced this summer. Hooley said the Iditarod decides its minimum purse two months before the relevant budget cycle starts and when bills start coming in, making it difficult to account for significant changes in expenses such as fuel. "We can't not bring dropped dogs back from the trail because we've met our budget," he said. "Those expenses on that side of the race are very difficult to control." According to a packet from the June 24 annual Iditarod Trail Committee meeting, race expenses between 1995 and 2016 had gone up 189 percent, to about $1.9 million. The cost to purchase straw and send it out on the trail went from $9,500 to $40,5000 between those same years, the document said. Marrs said he felt there was a "50-50 chance" the 2018 purse would increase by the time the race starts in March if the Iditarod is able to attract more sponsors. While longtime race sponsor Wells Fargo dropped its sponsorship, Hooley said Wednesday he did not know of any other top sponsors withdrawing their support. The Iditarod will announce the final 2018 purse in December, according to the race rules. So far, 61 mushers have signed up, including defending champion Mitch Seavey.